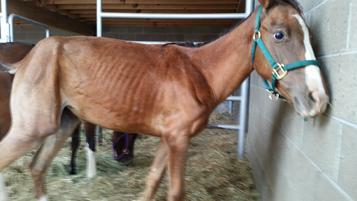 On Friday, July 27th, we got a call from a man desperately looking for help for 2 yearlings he had rescued from a lady. She had them advertised on Craigslist as "$50 Weed Eaters". 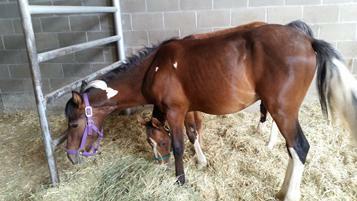 He'd owned them for a couple weeks but couldn't get the filly, now named Baby, to improve. We went to see what was happening, and the sight was enough for us to call the vet clinic and tell them we were bringing them in. Initial exams showed both to have elevated temps, as well as undernourished, dehydrated and very thirsty. Blood work shows elevated white blood cells. Baby, the bay filly, was in the worst shape. Scout, the paint colt, was better off in general, but no where near normal. Baby relies heavily on Scout to lead the way. The two are very bonded. They will remain at Animal Haven until their condition improves enough to transfer them to FCER. 7/28/18 Baby is now on fluids. Both are eating and drinking. Still elevated temps. 7/29/18 One of them had a plastic grocery bag in the stool this morning. Probably Baby, and now she has diarrhea. Maybe more foreign bodies will flush out.